Last week I offered a free class on visualisation and meditation. It was a lovely candle lit affair. 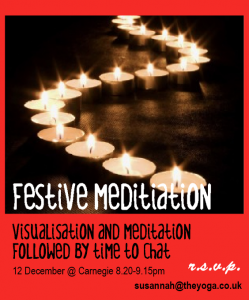 We did a festive visualisation, followed by sitting watching the candle flame. I can thoroughly recommend some peace amidst the lovely chaos. This time of year is renowned for bringing up excitement, old issues and stress as we renew traditions, see family and dream of how we’d like it to be. Christmas is such a traditional time, when we remember how it was as a child, and adapt it to suit our present. Only sometimes these get mixed up – we hear in our heads that ‘the decorations should go up on…’, ‘we always have x with our y’ and for a ‘proper christmas….’. This is the time you need to take some time out, do some yoga, take a walk and give yourself time to listen to what’s going on inside. Once you’ve heard the conflicting opinions a strong dose of self empathy and then a bit of creative dreaming should do the trick. The big day. I used to get very stressed about Christmas as I planned for that one big ‘perfect’ day. Now Christmas runs for the whole of December, just one day where there is a bigger celebration. This helps me enjoy each moment and stay with the here and now. Doing what you can with calm, and then allowing the rest to happen – whether the trifle is gloopy, the present a double or the day a sea of chaos- is the key to finding your inner yogic calm. Once you’ve accepted an inability to control absolutely everything life becomes a lot more manageable! Maybe its OK if everyone else has x, and you have y, or that you give socks to everyone? Your christmas spirit is more important than the food on the table, the decs on the tree or the well wrapped presents. You give a paultry offering when you get the ‘right’ present and give it without heart. Your love is worth more than any present you can give. This year the yogic challenge is to prepare, and let go of the outcome so we can open our hearts and allow that real ‘festive spirit’ to flow.